""When I send out a gift to my clients it's imperative that everything goes right. If something goes wrong, it reflects badly on my company,"
Save time. We�ll handle your mailing list. Ship when you want�Order now. Ship Later. Our customers tell us..."Sending coffee cakes is better and less expensive than sending flowers..."
This holiday season, or anytime, make your company or business stand out from the crowd. Send your key customers, clients, or employees a wonderful gourmet gift from CoffeeCakes.com. We offer a variety of affordable gifts, perfect for holidays, birthdays, anniversaries or any gift-giving occasion. 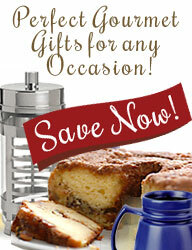 There's simply no better way to say "thanks" than through the CoffeeCakes.com Corporate Gift Program. Save money with your business gift order. We make company gift-giving easy! Whether you�re sending just one business gift, gifts to multiple addresses, or a large order to a central location, we can handle it. And so that you don�t have to enter in every order, send us your list of addresses and we�ll do the processing for you. Plus, we can customize your order by inserting your business card, including a personalized gift card or letters on your company�s letterhead in each gift package. To ensure quality, we will personally process your order. We can work within your budget, too, to help you select just the right gifts your customers will appreciate. Our customer service is unrivaled � we treat your clients as if they are our own. We guarantee your satisfaction before, during and after the delivery of your gift. Order early to make sure you get the gifts you want to send. Then just let us know when you want to ship them. To order, to discuss your discount or to get more details about our Corporate Gift Program, call us at 800-804-8997. Or email us at info@CoffeeCakes.com. We gladly accept Money Orders. Personal checks are not accepted at this time. * Please note that we do have certain criteria for selecting businesses to participate in our business gift-giving program. We reserve the right to refuse a business at anytime and/or disqualify a business from our business gift giving if these criteria are not met. CoffeeCakes.com is not a distributor or wholesale merchant. The CoffeeCakes.com Corporate Gift Program 800-804-8997 email: info@CoffeeCakes.com. Best Sellers from CoffeeCakes.com. We continually update our Best Sellers List to keep you current on the latest trends. Select a gift from the Best Sellers for quick, simple shopping and a gift that is sure to please. We have just the right cake to make any occasion, extra special. We have just the right cake to make any occasion, extra special. Choose from over 80 irresistible gourmet cakes, including scrumptious chocolate coffee cakes and our best-selling traditionally-baked coffee cakes. We have just the right cake to make any occasion, extra special. Choose from over 80 irresistible gourmet cakes. Sour cream coffee cakes baked by My Grandmas of New England are a traditional favorite. Weather you celebrate Hanukkah, Kwanzaa, Christmas, Thanksgiving or are just looking for a thoughtful tasteful gift. For the past 20 years CoffeeCakes.com has celebrated family traditions with traditional coffee cake. We love to hear from our customers about your holiday traditions, and definitely let us know if there is a special treat you would like us to offer for your special holiday tradition! Happy Holidays! Let them choose their favorites with CoffeeCakes.com Gift Certificates! Send the store! E-mail Gift Certificates from CoffeeCakes.com are extremely easy to purchase and redeem.